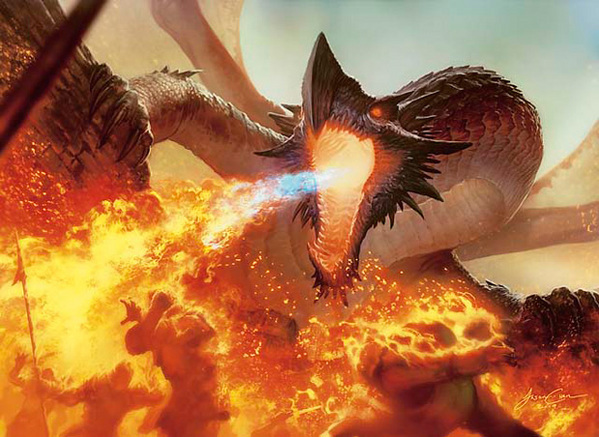 Welcome back as we round the bend for the final installment of our Magic 2011 precon deck reviews with Breath of Fire, a Blue/Red aggro deck in support of the devastating Ancient Hellkite. With Scars of Mirrodin some ways off yet, we look forward to delving into Duel Decks, Planechase, precons from other sets, and blasts from the past in the meantime as we head towards October! 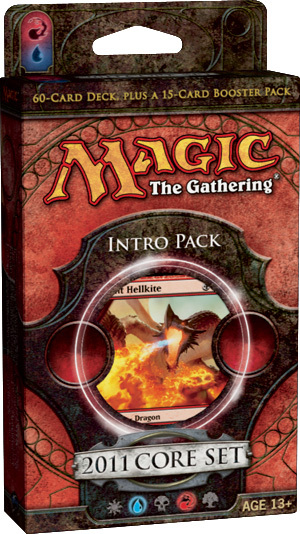 Magic 2011 has presented us with three decks which pair opposing colours: Blades of Victory (W/B), Reign of Vampirism (B/G), and Breath of Fire. As reviewed here, Blades had a very successful model: use a creature-based strategy as your primary win condition, and use a splash of a second colour in support of the primary. For Blades, this meant an army of White Weenies with some Black removal to get them through. Reign of Vampirism, however, had a quite different approach, feeling for all the world like a mono-Black deck that had Green thrust upon it. Sadly, Breath- while well constructed- seems to follow in its footsteps. Notice that there are no one-drops and very few four-drops to be found, as we’ll be returning to this later. While the overall power level of the early creatures remains rather minor (approximately two-thirds of the deck are weenie-sized critters), Breath augments this with some flexible utility. The Ember Hauler, for instance, is right on the curve: a 2/2 for two mana, but has the added ability to be sacrificed for two damage. Later in the game when he might not be as useful, he’s still a three-mana Shock. Goblin Tunnelers allow for some damage through on a stalemate (and pair well with the two Chandra’s Spitfires, who can grow in power after they’ve been targeted by the Tunneler for some added damage through). A pair of Prodigal Pyromancers have a versatile role to play as well- not only do they fill the usual role of the pinger (sniping 1/1’s, finishing off wounded enemy critters, extra damage to your opponent), but they too combo well with the Spitfires. Two Fiery Hellhounds round out the three-drops with some extra muscle. Moving into the more expensive beaters, the Canyon Minotaur suffers dreadfully from comparison with the Cyclops Gladiator, inferior in almost every way, though that’s the tradeoff from being splashable (like the Minotaur) versus quite dedicated (in the case of the Cyclops). From there we find a pair of Berserkers of Blood Ridge (strictly worse cards than the singleton Stone Golem), a Fire Servant and his cousin, Earth Servant, and lastly the premium rare, Ancient Hellkite. This dragon’s an absolute bomb, but his high casting cost (7) means he’ll be an uncommon occurrence in a deck with no ramp options whatsoever. Much like Reign was build around its Vampires and you wanted to avoid losing them, you should try and protect your Chandra’s Spitfires here. The most synergistic card in the deck, using Goblin Tunneler to make it unblockable, then pinging your opponent with the Pyromancer and sending it though will probably win more games for you than the Hellkite could ever dream of. Add in additional burn (Ember Haulers, Lightning Bolts et al), and the Spitfire can get frighteningly big very quickly. Try and work the deck around that whenever possible for the best chance of success. The noncreature spells themselves are very well-selected for the most part. The most impressive inclusion is a trio of Lightning Bolts. It’s hard to argue that they’re the most efficient burn card in the environment today, and instead of including some inferior options for the sake of ‘variety,’ the developers of the deck acknowledged the absolute necessity of the card in a burn deck by including this many. Kudos! A Preordain and an Unsummon round out the one-drops, all of which are solid selections that will help when drawn at any stage in the game (quite unlike, say, most one-drop creatures). The two-drop Negate feels out of place in an aggressive deck. Call to Mind, by contrast, can fetch any number of burn spells and therefore is a solid inclusion. Indeed, the latter is probably the Blue card that most feels at home in this deck, rather than just shuffled in for the sake of a two-colour deck. Some solid burn (three Chandra’s Outrages, a Fireball and two Lava Axes), an Aura (Shiv’s Embrace) and a Foresee round out the deck. I don’t ordinarily care for Lava Axe (an extra Bolt and Outrage would have been preferable), and I care less for it here, where both the Bolt and Outrage would have the same synergy with the Spitfires but give a great deal more flexibility. Considering an extra Lightning Bolt, how much better are two points of damage really, when you are paying four mana more to cast them at Sorcery speed? The only saving grace is if you’re able to get it off while the Fire Servant is out- “catch!” indeed. Breath of Fire– like many precons- does suffer some from suboptimal card choices (most notably the Berserkers of Blood Ridge, the Lava Axes, the Minotaur and even the lowly Goblin Piker), but in such times it is important to remember that Wizards is working within certain constraints and that these decks are not designed to be ultracompetitive. On the face of it, for instance, Stone Golem is a comparable to the Berserkers when comparing power/toughness and cost. The Berserkers, however, have the drawback of requiring an attack each turn, even when that attack might be unprofitable. That the Stone Golem is vulnerable to artifact kill is a minor consideration (one Naturalize and one Solemn Offering in the other four precons)- it’s mainly because the Golem is Uncommon. With only 12 Uncommons per deck, a balance does have to be struck. The greatest sin of Breath, then, is that it feels forced. As mentioned above, there’s only one Blue card in the deck that has any synergy with the Red spells, and that’s Call to Mind. Everything else is simple utility and Scry options. Don’t get me wrong, Scry is fantastic, but it’s hard to escape the nagging feeling that the deck could be even faster and more lethal with Blue stripped out of it. As it stands, it feels just a bit too slow and cumbersome to fill the traditional role of the Red deck: strike fast and burn hard. So the questions remain: Does the utility of the Blue more than compensate for the weakness of splashing it? Is the deck focused enough to do the job? And are the pair of Spitfires enough, or does the deck have a strong win condition on the ground? Join us next time when we take Breath of Fire onto the battlefield, to see how it measures up. They’re always going to throw sub-optimal cards into precons, no matter what. Except maybe those premium deck things. Although only slivers has come out so far and there weren’t too many sub-optimal slivers in there. They just can’t put too many good cards into precons or else people will just buy lots of precons and less boosters. Oh well. C’est la vie. If it’s a dragon, I want it to have haste or I’ll find one that does. Okay, whelp and other lower mana cost ones are fine without it, but the big boys I want to have haste if I’m going to use them. It adds a little extra flavor to me for them to have haste. A dragon diving from the clouds breathing fire upon my fore, not a dragon showing up and saying hi before toasting anyone.